Sednem u 15icu malo pripit jer sam radio ceo vikend i pored mene sedne neko ko na telefonu ukljucuje hettrik. Onako, veliki zeleni ekran i sve jasno na njemu. Posto nisam cuo nekog da je u poslednjih par godina poceo da igra hettrik pitam ga: "Koliko godina igras to cudo?" On kaze: " paaa evo oko 5 godina. A jel pratis reprezentaciju?" Kaze da jeste i pita za nick. Kad ono.. Skapiramo iz nadimka i naziva tkma - pored mene sedi kolega iz lige!!! As Ernest Hemingway wrote in his story "The Old Man and the Sea": "A man can be destroyed but not defeated." This sentence really fits into the history of one of Hattrick users - 80 years old ignac35 (5827577). 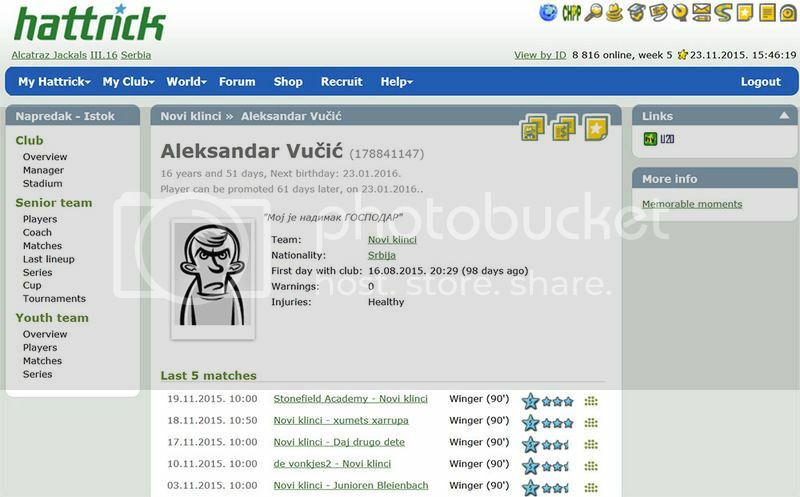 This is the interview with him - the oldest user of Hattrick in Poland, maybe in the world too. 1. Welcome. How are you? How do you feel? It is a real honor for me to work with you on this interview. It will be a tribute to you, your personality and your passion for this game. Not many of us will still play in Hattrick, having 80 years. Can we start? Human nature (for most people) likes to be treated with interest. Such interest in my person I think is very pleasant for me. The fact that in such an advanced age I still play, it is somewhat unusual. Bad enough that this anniversary coincided exactly at the time when I decided between selling off an aging team, demoting to a lower league and then rebuilding it, or just quitting the game. The most important argument to give up the game is a serious illness of my wife (double stroke and a broken back) - in my advanced age and also with a number of ailments, I'm in the process of deciding whether to stay in the game. My friends didn't even allow the thought that I will finish the game. Returning to the human nature, I am at your disposal. I only fear that my old brain won't cope with the task. If there's anything wrong, please go slowly "step by step". 2. When were you born and what are you doing in this game? I feel like I have 80 years and a limestone in my head. I was lucky to be born 31.03.1935 in Torun [Editor's note: town of Nicolaus Copernicus]. What am I doing in this game? It seemed to me that I fight for trophies, for victory. But opponents showed no respect for my age, showed me where is my place - in line. They treat me like an equal. And I like it, I must say. I feel that I'm still alive and I can still compete with young people. 3. As you said, things go wrong in your club. Time for some rebuilding? I waited a little too long for the renewal of my club and the players lost on their value. One more season and probably "Romania" would have gone bankrupt as well. The decision was taken almost at the last minute (I think my accountant at the club is more calcified than me). Now I want to wait for lower prices of players. I will call a new coach. I'll buy attackers to train and maybe even promote again. If I just have enough time. Too many household duties. And that I think is most important. 4. What do you do outside of Hattrick and outside the household chores? How do you cope with the computer as a 80 years old? Actually responsibilities of caring for home and family are the most important things and fill the day, so that the day becomes a bit too short. In this age everything becomes a lot slower. I stopped gardening, which had previously been my joy. Somewhat I neglected the small ponds over which me, my wife, friends and neighbors drank gallons of coffee. Such is the way of things. How to deal with a computer? The first time I sat down at a the computer was in December 2005, when I was about 70 years old. I was ashamed in front of my children, that I am so old, and I still have such fancies. "Kids" - 50 year olds - took this with joy and bought me a computer. The beginnings were difficult and even today some things are. At this age people have problems to learn new things. But slowly I learned some things. I'm not an ace, I will never be a computer scientist, but somehow I'm managing. Currently, I can not imagine existence without access to the Internet. How the world functioned without the Internet? 5. The Internet... what sites do you visit outside Hattrick? What do you like to watch, read? Do you have friends on line? Do you know people from Hattrick in the real world? I know that at one time you were friend with drago (2909702), who does not play Hattrick anymore, but he was a well known figure in the Polish Hattrick community - ex-coach of Polish National Team. Most visited outside the daily news are sport pages, some other internet games about gardening, culinary sites (I am forced to cook). I use Skype messenger to have visual contact with my family spread across the world. I read just the local press and my favorite newspapers. My eyesight does not allow for more. In the real world I have many friends from the world of HT and not just neighbors. Drago and his wife visited us very often. Today I have only telephone contacts with him. 6. Who encourages you to play Hattrick? In other words: how did you get here? A friend of mine introduced me HT - jertorb (6864125), he used to take strong arguments to persuade me. Many thanks to him for that! 7. What do you like in Hattrick? And what you don't? If I participate in this game, it means that I like it. Sometimes I do not like arguments in discussions on the forum. But I have the right to ignore them. 8. Can you describe your day? From the moment you get up until you go to sleep. How does the day pass to a 80 years old man? I hope that we all live to see your years and like you still playing in Hattrick! The day is subordinated to my sick wife. She has had two strokes and has a broken spine. My life is devoted to her and her needs. These are quite intimate matters, such that I can not describe it here. I get up at different times. A lot of my time, even if I have it very little, I spend (it may seem ridiculous) in the game "My free farm". We treat it as a mental rehabilitation for her. With rather good results. All duties which are to do at home - this is a two storey house with our own garden - and that are normally divided between two spouses, I have to do by my own. Shopping, breakfast, cleaning, preparing meals, washing the dishes... who has a family knows what we talking about. In addition, my age and my various ailments make sometimes that I just have enough. There are such moments and there are many more that I can fulfill the promise of 60 years ago, that I will not leave her and so on. And that makes me happy. I do not have a specific time when I need to do something - I react to the needs of the moment. Rather, there is nothing interesting in this story. We met at the workplace. It immediately clicked and sparkles till today. It is said that love turns into a habit, but there are times that I like to hug my wife. Then we both can feel internal warmth and any problems go away for a moment. There is a warm feeling of joy that we are together. I can not say that our life was a paradise. There were difficult moments, quiet days, disputes. But there was never bad words and violence. There was no engagement, we were poor. I was an orphan, and my wife without a father. Friends from work (we worked in the City Hall) arranged for us a wonderful civil marriage ceremony. Unforgettable moments. Later, the prose of life, two adorable sons. Around us we almost always had friendly people, and truth to be told - with very few exceptions - it is like this till this day. 10. What is the name of your loved one? My wife's name is Lydia. The wedding took place in 1954. Family curiosity may be fact that the first son born 05.05.1955. We gave him the name Waldemar, without checking the calendar and it turned out that the name day is 5th of May too! 11. You were just 19 years old on the wedding day, and you have 61 years of marriage in total! Is there a couple in Poland, which has more years of marriage than you? Well counted. Keep in mind that I was an orphan, and the creation of a full family, in my case, it was something important. Fortunately, fate has given us a sense of responsibility and the words "unto death" are the most important for us. I will open up before you. I have two sons, three granddaughters and one grandson and five great-grandsons and three great-granddaughters. The oldest great- granddaughter is 15 years old. We agreed that we will not die as long as she does not marry. Youngster said she won't marry, and now we have to live As for the 60 years of marriage, there are certainly lots of families like this. 12. This 15 years old girl is so nice, won't get married, and you should be able to live and live ... and may your happiness last forever. You said earlier that your wife is seriously ill and has, among others, serious problem with the spine. It was an accident? It's hard to say exactly. During a stroke she fell and so she broke her spine. Fortunately, it's a non-displaced fracture and without damage to the core. However, about a month she was sleeping in a sitting position on the chair. It was a terrible view, she was terribly tired. Each cough it was such a horrible pain. She spends many hours in front of the computer (has her own), and even if she is a few months older than me, she pays all house bills by the internet from our bank account. She is so cool! 13. Let's get back to HT. What do you train in Hattrick? What tactics do you like to play? What settings? Now - as I said - I am no longer involved in the game. However, I decided that I will stay with you for some time. In the middle of the season I'm going to buy players, call a new coach and train scoring. This obliges me to play line-ups with three forwards, which is 2-5-3 and 3-4-3. I play very often with one wing. So far I trained scoring, making the rotation of trained attackers and leaving the three of them to the needs of the team. I was very stingy, and I didn't want to sell any players. I had pretty strong reserves. The reason for doing so was to have the satisfaction of victory, knowing that I'll stop playing anyway. But I'm still here. (8110252) - and this is my son who lives in England. 14. So you have friends who have a common denominator for real life and Hattrick. One of your sons plays Hattrick. In addition, your beloved wife has nothing against it. Unusual! One of my old friends in Hattrick said that Hattrick is the only game with a soul. But what did you do when there was no internet? What was your entertainment? Reading books (what), watching movies (what), board games (what), card games (what), socializing (with who), walking-tours (where)? This is a broad topic. Like almost every male I am interested in sports in a broad sense: football, volleyball, tennis, F-1. To tell the truth - every sport where Poles have some achievements. I'm glad of their achievements, and then I feel better. Myself rather average, I played chess and bridge. During my entire adult life I loved angling (fishing with rod and line). Here I had a lot of achievements. Several times champion of the association. I represented the association at the regional championships, but usually with a rather weak effect. Interesting that my wife was interested in angling too, but just for fun. Walking? We were both very active in PTTK - Polish Tourist and Sightseeing Organisation. Walking in the mountains, even with the kids in a backpack, ah! that was it. Later evening fatigue, morning wash in the creek and continue on the road. We have many miles in the legs. We stayed in Szczawno Zdroj. Sudety. Later Myszków near the foothills. In those days, plants, factories had coaches to deliver us - fanatics, where we planned. The same with fishing. We have a lot to remember. Pripazi se, čuo sam da se sprema zavera protiv ovog igrača. Da li je gledao preko youthclub-a ima li blizanca? Koji li će spec dobiti baš me zanima ?